Check out my other items. 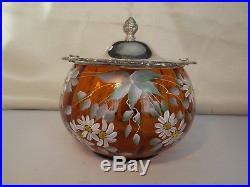 Art Glass Hand painted Cracker/Biscuit Jar- Amber Glass Silverplate Lid & Handle. Looks like a Fenton product but I do not know for sure. 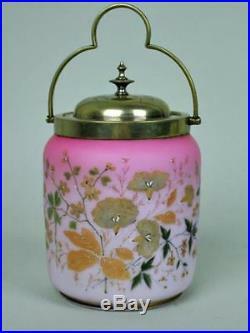 Jar measures 7″ H and is 7″ wide. Hand painted daisy flowers and signed. Good condition, no chips cracks or crazing….